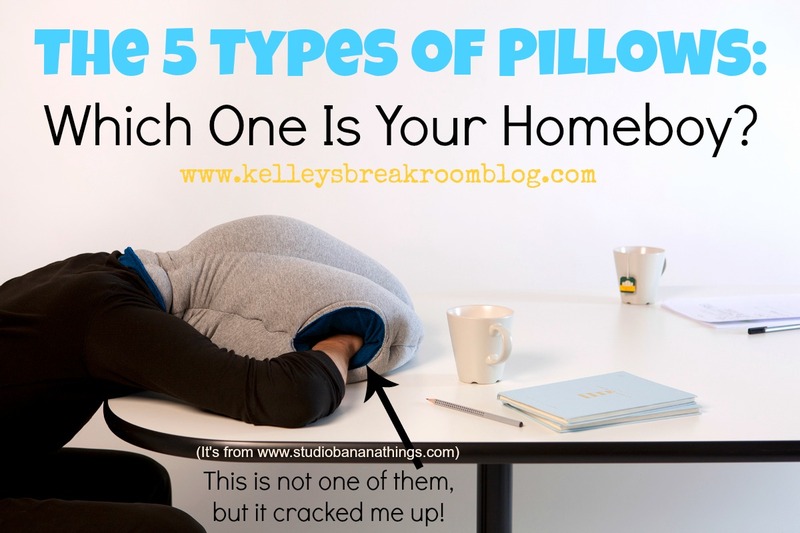 You are at:HomeUncategorizedThe 5 Types of Pillows: Which One Is Your Homeboy? The 5 Types of Pillows: Which One Is Your Homeboy? My husband is really particular about his pillows. He absolutely insists that they be made of some kind of material and some kind of stuffing. Luckily, all pillows are made this way, but not all pillows are made equally. I think we all know this very well. On our bed are four pillows that are meant to sleep on and seven for decoration. Out of the four that can be slept on, there is only one that really passes his test. There are a couple that look and feel alike to me. If I happen to go to sleep with his favorite pillow before he does, he doesn’t pull it out from under my head (usually) but will frown himself to sleep. He loves his pillow. It’s like his homeboy. I might get one of these shirts made for him. For real. What makes a particular pillow someone’s homeboy? You know…the pillow you want with you wherever you go. The pillow that is always by your side when it’s time to sleep. The pillow that has your back in a fight. The pillow that will go with you to the movies. The pillow for which you’ve developed a special handshake. The pillow you don’t hand out first when guests come over. You try to give them a nice pillow, but you’ll never hand them your homeboy pillow. 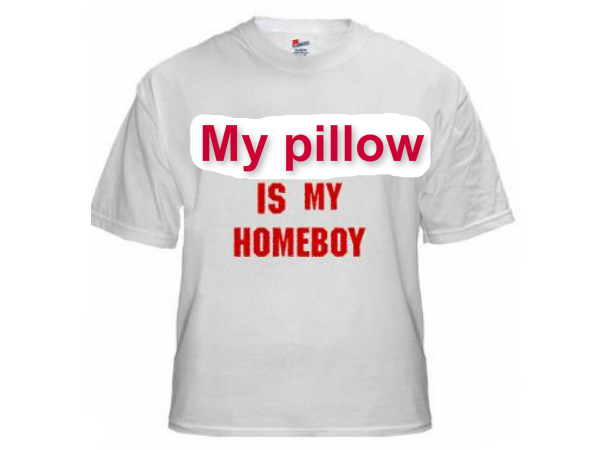 What is so special about your homeboy pillow? Well, I can’t answer that. The answer to that question is between you and your homeboy. I can tell you that pillows fall into five major categories, though. Trust me. I have a bachelor’s degree in Pillowology from The Mattress Firm University (Gooooo Boxsprings!!) and I’m working on my Master’s at The Mattress Giant Institute (Goooo Tempurpedics!!) right now. This one has got to be the worst. How does any pillow maker assume someone is able to sleep well on a boulder? When lots and lots of people walk into Macy’s to request directions to the “very large rocks for pillow section”, maybe then pillows should start being made this way. Only then. I have a confession. My 4-year-old’s pillow is a bit papery. It’s kind of flat. He’s 4, so he doesn’t know that his pillow kind of bites. He has another, better pillow on his bed, but he always goes for the paper pillow because he doesn’t know better. I feel horrible now. Adults don’t typically like paper pillows. They require a lot of folding and shaping before any semblance of sleep can be achieved. This one was folded and shaped so much by this dude that he ended up creating some origami unexpectedly, which is pretty impressive. The Fortune Cookie Pillow will just wrap your head in it with no mercy. Both sides of your pillow are extremely fluffy and awesome, but the middle, the middle where your dang head is located, is flat, flat, flat. Your head is touching the boxsprings because it’s so flat. You feel like your head is the hamburger meat inside a cotton taco. This is no bueno, mis amigos. I like a good feather pillow as much as the next girl, but some of them are just vicious. Some of them make you wonder if, instead of feathers, the pillow makers used porcupine quills, or perhaps even glass shards. 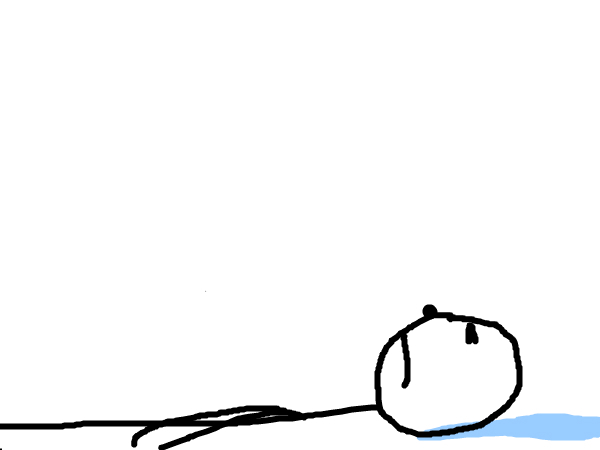 You wake up in the middle of the night in pain and feel like you’ve been hit with a tranquilizer dart. After not being able to fall asleep due to rogue feathers and a few straight pins sticking out of your pillow, you’ll wish someone would hit you with a tranquilizer dart. This pillow is, you guessed it, juuuuuust riiiiight. Everyone has their own reasons why a pillow is their favorite. Everyone has different reasons for choosing one pillow to be their homeboy or homegirl. As long as the pillow doesn’t cause me bodily harm, and is not wanted by a really huge angry bear, I’m usually pretty good with it. Which pillow is your homeboy? Which one is the least likely to go with you on a trip? Which one makes the best pancakes? *Originally published in spring 2012.